A map of global temperatures is very helpful in better understanding how our record-breaking cold fits into overall global warming. 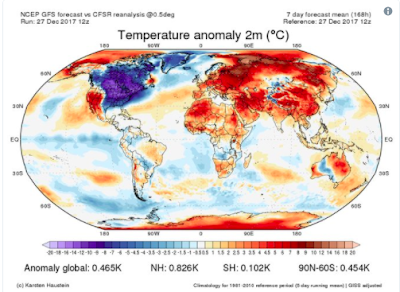 Red indicates parts of the world that are currently warmer than normal, with that blob of blue over North America showing that our comparative cold is an isolated event. To compensate for parochial perceptions of climate, news media need to be displaying these maps frequently. There's another way in which our frigid temperatures, predicted to continue for the next week at least, could be an effect of overall warming. A climate scientist at Rutgers, Jennifer Francis, has been studying how the radically warming North Pole could be weakening the jet stream. As these high altitude winds slow, the jet stream begins to sag and stagnate. This in turn leads to the sorts of stalled weather patterns that contributed to the record breaking flooding in Houston this past summer. Presumably, this same "increase in persistent weather extremes" in the summer, a consequence of climate change, would hold true for the winter as well. From what reading I've done, the jet stream functions like a belt, or an abdominal wall that rings the planet, flexible but strong enough to keep the arctic weather mostly contained to the north. The big freeze we are experiencing can be thought of as a giant hernia, in which that wall weakens, allowing arctic temperatures to spill southward over the U.S.
Making my usual morning coffee and toast, 7am on Christmas morning, I became aware of an unusual silence. It came from outside, where so much was not happening, so many cars not going by, so many trucks parked for the day, so many planes not flying overhead. It made me think of Santa, and how he might long ago have had the whole night to himself while the world slept. By the time I stepped outside, though, a car was coming by, and another, and the poignancy was gone. Maybe there was a moment, sometime in the night or early morning, when all people were happy right where they were, and felt no need to be somewhere else, and the great white noise of machines stopped for that glimmer of time, opening up for all to hear, a clear, crystalline silence. Behavior that makes a community more sustainable in the longterm tends to be invisible and inaudible. No one sees you not driving, or using less energy in the home. No one hears you raking leaves. Neighbors don't see a backyard compost pile. Solar panels don't make demands on our awareness the way traffic and airplane noise does. How then to model sustainable practices, given that people tend to copy what they see and hear their neighbors doing? Have a pollinator garden, solar panels or compost pile hidden somewhere? Don't keep it secret. Tell the world. During a recent visit to Bloomington, IN, I saw a lot of these signs, indicating that the homeowner has some solar panels somewhere on the roof. Given all the reasons people can conjure for not adopting more sustainable practices, signs like these provide some reassurance that others have overcome their inner resistance and perceived impediments and taken action. Lacking a sign, I decided to use a frontyard demonstration instead. Home composting of yardwaste and kitchen scraps is typically done in the backyard, while the more energy-intensive practice of piling leaves in the street for pickup by heavy machinery is highly visible. This "Wishing the Earth Well" leaf corral serves as a sign of sorts. Since the decorative hubcap was stolen (I guess it's a compliment), a pumpkin has been sitting in as a cap for the inner column where food scraps are tossed. Gravity works in one's favor with a leaf corral. The leaves continue to settle, leaving room for more when the oaks drop their last leaves. People often think compost piles need a lot of turning to aid decomposition, but if the leaves are moist and the leaf corral is set on bare ground, the decomposers work up through the pile on their own. This fall, the corral yielded a bucket and a half of high quality compost for the raised beds. Demonstrations like this are made to show how easy and rewarding sustainable practices can be, if humanity ever chooses to adopt them. I'm sure this isn't always true, but it sure was yesterday afternoon, when I was organizing the frig in preparation for a party, and accidentally spilled an open can of soup. Tuscan-style white bean soup, which I mistook for minestroni as it began dripping down from one shelf to the next. Sponging up the mess caused me to notice that the whole frig needed a cleaning. Stirred by that special party-prep energy, I launched into a full cleaning. I doubt anyone will notice. People will see a clean frig and assume it always was--such is our capacity to overlook a slow accumulation of dirt. No matter. A clean frig has its own satisfactions. The experience got me thinking, though. What other cleaning and organizing could I incite by making things worse, in order to make them better, of course. A shout out to the Princeton University women's soccer team for some exciting play this fall and a deep run in the NCAA soccer tournament, reaching the quarter finals. They combined a tenacious defense with a potent, free-wheeling offense that won the Ivy League title and took some much larger schools in other leagues by surprise. Though I seldom follow sports, the soccer team and its season pushed some buttons for me, having come from a small town in Wisconsin whose high school teams, orange and black bulldogs rather than tigers, played against larger schools and often won. What drew me to sports as a kid was the skill, teamwork, improvisation, and the exhilaration of running pell mell down a field. Women's soccer brings those qualities to the fore, leaving brute strength and body blows to other sports and other fans. At some level, the women's soccer games serve as a salve in this political era. The games are honest--no phony writhing in pain like one finds in men's professional soccer. There's all that positive energy of players giving everything they've got to a shared goal. No room for laggards or selfish agendas. At the same time, the players are free to express their personalities on the field--each with a distinct style. With no time outs, the coach often out of earshot, the team must depend on its own wits and chemistry. The fluency of precise passing doesn't play out as static ball control, but always leads somewhere interesting, with near goals often as exciting as the goals themselves. Soccer games at Princeton U. are free and open to all. Knowing no one in the stands, I'd engage in the action but also feel a solitude, a sense of having stepped out of my accustomed orbit. My youth in sports was eclipsed by an adulthood of music and environmental work, but even a native plant advocate can get drawn back to the action on that broad sward of green. Go Tigers!